This issue The Campanil staff discusses the future of education in the hands of Betsy DeVos. In this issue, the Campanil Staff discusses the Democratic party and their responses in the past few weeks. The Campanil staff discusses what it means to be a journalist today and how to approach the news now. The Campanil talks about ways that people can show solidarity with those who have been targeted after the elections. The Campanil discuss the support the faculty has provided the student body, especially after the election results. All the articles written by The Campanil staff. 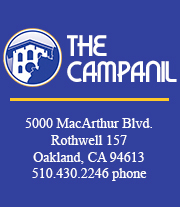 Tweet at us @thecampanil.